1) In large bowl, whisk oil, vinegar, mustard, sugar, pepper, tarragon and red pepper flakes. Cube turkey; add to mixture. Cover and marinate overnight. Drain turkey from marinade; discard marinade. 2) Broil turkey 5 to 6 inches from heat source 10 minutes or until turkey is heated. Fill pita pocket with turkey and tomato. 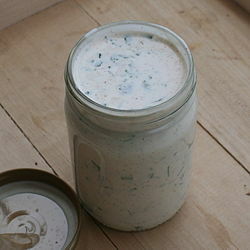 3) Drizzle ranch dressing over turkey. In the early 1950s, Steve Henson developed what is now known as ranch dressing while working as a plumbing contractor for three years in the remote Alaskan bush. In 1954, he and his wife Gayle opened Hidden Valley Ranch, a dude ranch near Santa Barbara, California, where they served it to the guests. It became popular, and they began selling it in packages for guests to take home, both as a finished product and as packets of seasoning to be mixed with mayonnaise and buttermilk. They incorporated Hidden Valley Ranch Food Products, Inc. and opened a factory to manufacture it in larger volumes, distributed first to supermarkets in the Southwest, and later nationally. In October 1972, the Hidden Valley Ranch brand was bought by Clorox for $8 million. Kraft Foods and General Foods began selling similar dry seasoning packets labeled as “ranch style”. This resulted in a trademark infringement lawsuit against both from the Waples-Platter Companies, the Texas-based manufacturer of Ranch Style Beans (now part of ConAgra Foods), even though Waples-Platter had declined to enter the salad dressing market itself out of fear that the tendency of such products to spoil rapidly would damage its brand. The case was tried before federal judge Eldon Brooks Mahon in Fort Worth, Texas, in 1976. Judge Mahon ruled in favor of Waples-Platter in a lengthy opinion which described the various “ranch style” and “ranch” products then available, of which many had been created to compete against Hidden Valley Ranch. 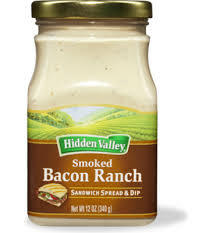 Judge Mahon specifically noted that Hidden Valley Ranch and Waples-Platter had no dispute with each other (though he also noted that Hidden Valley Ranch was simultaneously suing General Foods in a separate federal case in California). The only issue before the Texas federal district court was that Waples-Platter was disputing the right of other manufacturers to compete against Hidden Valley Ranch by using the label “ranch style”. Meanwhile, Clorox reformulated the Hidden Valley Ranch dressing several times to try to make it more convenient for consumers. The first change was to include buttermilk flavoring in the seasoning so that it required adding standard milk rather than buttermilk. In 1983, Clorox developed a more popular non-refrigerated bottled formulation. As of 2002, Clorox subsidiary Hidden Valley Ranch Manufacturing LLC produces ranch packets and bottled dressings at two large factories, in Reno, Nevada, and Wheeling, Illinois. During the 1990s Hidden Valley had three kid-oriented variations of ranch dressing: pizza, nacho cheese and taco flavors. Ranch dressing is common in the United States as a dip for vegetables such as broccoli and carrots, as well as for chips and “bar foods” such as french fries and chicken wings. It is also a common dipping sauce for fried foods such as fried mushrooms, fried zucchini, jalapeno poppers, onion rings, chicken fingers, and hushpuppies. In addition, ranch dressing is used on pizza, pickles, baked potatoes, wraps, tacos, pretzels, and hamburgers. While popular in the United States and Canada, ranch dressing is virtually unknown in many parts of the world. In places where ranch seasoning is used to flavor snack foods, the flavor may be described as “American” flavor. Ranch dressing is produced by many manufacturers, including Hidden Valley, Ken’s, Kraft, Marie’s, Newman’s Own, and Wish-Bone. 1. – In a large bowl, whisk together the mayonnaise, sour cream, chives, parsley, dill, garlic powder, onion powder, salt and pepper. Cover and refrigerate for 30 minutes before serving. The easiest way to use leftover deviled egg filling is to make a tray of sandwiches. The recipe for deviled egg filling is nearly identical to the recipe for egg salad. You may want to add more mayonnaise to make the filling smoother. You may also want to add other seasonings and chopped vegetables, such as cayenne pepper or chopped celery. Toast enough bread slices to make the number of sandwiches you want. Top a toasted slice with lettuce, a piece of fresh tomato, some deviled egg filling and the other slice of toast. If desired, you can make finger sandwiches using bread with the crust cut off and sliced into small rectangles. You can make a dip out of unused deviled egg filling. Place the filling into a large bowl and add anywhere from 1/2 cup to 1 cup of mayonnaise or sour cream, depending on the amount of filling you have. If you have less than 1 cup of filling, use more mayonnaise; if you have more than 1 cup of filling, use less mayonnaise. Stir this mixture thoroughly with a whisk or spoon. Add a package of ranch or French onion dip mix, if desired. For another idea, mix the deviled egg filling with prepared guacamole. Serve either recipe with chips, crackers or small vegetables. You can give the classic breakfast dish, eggs Benedict, a unique twist with this recipe. The normal recipe consists of a poached egg atop a slice of Canadian bacon on an English muffin covered in Hollandaise sauce (a rich, egg-based sauce). Substitute a scoop of deviled egg filling for the poached egg and you have a whole new dish: deviled eggs Benedict. Instead of attempting to make homemade Hollandaise sauce (which can be difficult), you can purchase Hollandaise sauce mix from grocery stores. Samosas are an Indian appetizer traditionally consisting of pastry stuffed with a potato filling. They are easy to make, especially if you use ready-made ingredients. Purchase a package of frozen O’Brien or hash brown potatoes, a package of frozen peas and a package of refrigerated pie crust or won ton wrappers. Cook some of the frozen potatoes with the frozen peas and season with curry powder, ginger and cilantro. Stir your leftover deviled egg filling into the potato mixture. Fill pie crust rounds, circles or wontons with the potato-egg filling and fry them in batches. These are perfect for a large gathering, such as a movie night or a Super Bowl party. Been a sunny but very cool day today, high only in the 40’s. It’s that time of year though and it’s my favorite time of the year. Everyone had been wanting Lasagna so Lasagna it was! I usually have a box or two of the Progreso Kitchen Favorites Classic Lasagna, which is our favorite, but I was out so I went to the store and both Kroger and Walmart not only was out of it but no longer carried it! Not good, I love this Lasagna. I even checked on-line and it looks as though Progresso has dropped it. So it was Lasagna from scratch. For dinner, Healthy Harvest Turkey Lasagna w/ Baked French Bread. I had only made Lasagna like this one other time and it’s been a while. I used the recipe that was on back of the Ronzoni Healthy Harvest Lasagna Box, Healthy Harvest Easy Lasagna. I made using the following; 1lb Jennie – O Extra Lean Ground Turkey Breast, 3 cups (26 oz jar) Ragu Light Tomato and Basil Spaghetti Sauce, 1 small container of Baby Bella Mushrooms (sliced), 1 1/2 cups Water, 1 3/4 cups (15 oz container) Miceli’s Lite Ricotta Cheese, 2 cups (8 oz) Sargento Shredded Mozzarella/Provolone Cheese, divided, 1/2 cup grated Kraft Parmesan Cheese, 2 Eggs, 1/4 cup chopped fresh Parsley, 1/2 tsp Sea Salt, 1/4 tsp ground Black Pepper, and 9 pieces Ronzoni Healthy Harvest Lasagna, uncooked. Cutting calories and carbs by using Ground Turkey Breast and the Miceli’s Lite Ricotta Cheese. Then to prepare it I just went by the instructions on the box which are: Heat oven to 350°F. In 3-quart saucepan over medium-high heat, brown meat; drain. Add spaghetti sauce, mushrooms, and water; simmer about 10 minutes. Meanwhile, in medium bowl, stir together ricotta cheese, one-half mozzarella cheese, Parmesan cheese, eggs, parsley, salt and pepper. 5. Pour about 1 cup sauce on bottom of 13×9-inch baking dish. Arrange 3 UNCOOKED pasta pieces lengthwise over sauce; cover with 1 cup sauce. Spread one-half cheese filling over sauce. 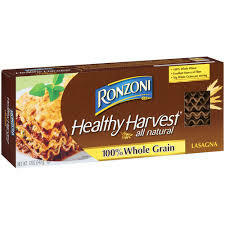 Repeat layers of RONZONI HEALTHY HARVEST LASAGNA, sauce and cheese filling. Top with layer of RONZONI HEALTHY HARVEST LASAGNA and remaining sauce; sprinkle with mozzarella cheese. Cover with foil. Bake 45 minutes. Remove foil; bake additional 10 minutes or until hot and bubbly. Let stand 10 minutes before cutting. The Lasagna came out perfect! The Healthy Harvest Noodles are 5 Star! A keeper recipe. I also baked a loaf of Pillsbury Rustic French Bread. For dessert later a Del Monte No Sugar Added Mango Chunk Cup. Whole Grain Lasagna are ripple-edged strips about 2-1/4-inches wide and 10-inches long. Almost exclusively used to make oven-baked entrées. Pasta is undercooked, then layered with tomato or cream sauces, cheese, meat (or seafood) or vegetables, then oven baked until pasta is done. 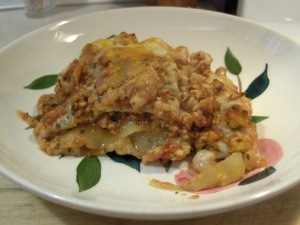 Whole Grain Lasagna can also be cooked longer to make roll-ups; individual pieces are spread with cheese filling, rolled up, covered with sauce and oven baked. Happy Labor Day everyone, hope you had a fun one! It’s been real muggy out today, and a rain shower late afternoon which made it worse. Not much going on, went to the store early and that was about it. 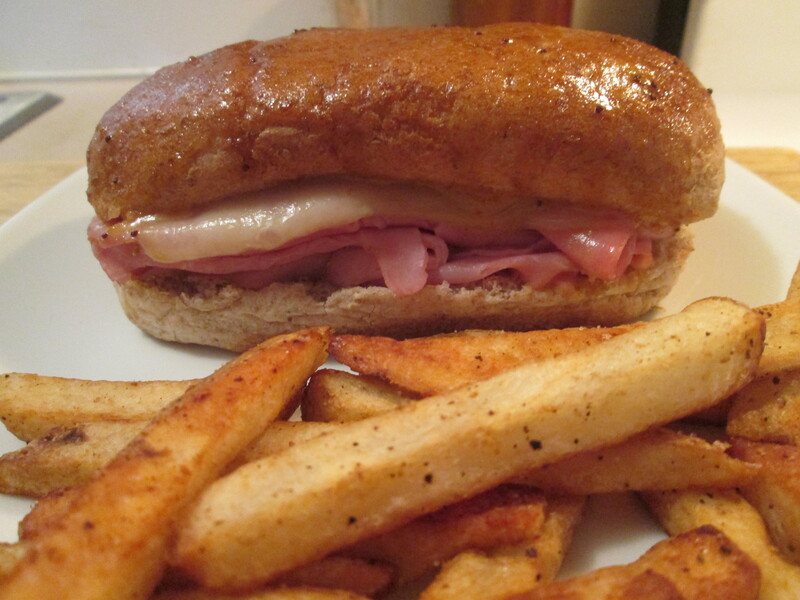 For dinner tonight I prepared a Baked Ham and Swiss Hoagie w/ Baked Fries. I used Aunt Millie’s Deli Style Whole Grain Mini Sub Buns and then for the Ham I used Kroger Brand Private Selection Oven Roasted Rosemary Ham. This has become my favorite packaged Hams incredible taste and it’s 70 calories and 1 carb per serving. The slices are very thin so I used a double serving of it on the Hoagie. I topped it with a new spread/dressing, Hidden Valley Smoked Bacon Ranch Sandwich Spread. Word of caution, this stuff is so good you’ll get a spoon and just eat from the jar! I think it’s new, I had a coupon I got from Sunday’s Paper and that’s how I found out about it. When at Walmart earlier I seen they had it in stock. They had about 4 different varieties of it and I went with the Smoked Bacon Ranch Dressing. I also topped it with 2 slices of Sargento Ultra Thin Swiss Cheese. I preheated the oven to 350 degrees and while that was heating up I combined tbsp. of Blue Bonnet Light Butter (Melted) , 1/2 tsp. dried onion, 1 tsp. Worchestershire sauce, 1 1/2 tsp. Poppy Seed dressing, and 1/2 tsp. yellow mustard. Mixed it to it was well combined. Poured the mixture over the sandwich. Covered it with foil and baked at 350 degrees for 15 minutes then remove foil and bake an additional 10 minutes to allow the rolls to crisp. Remove from oven to cool and served. Great recipe for Baked Ham and Swiss Sandwiches! The Poppy Seed Dressing Mixture that tops the Hoagie pulls everything together, all kinds of flavor! I also baked some of the Ore Ida Simply Cracked Black Pepper and Sea Salt Country Style Fries, love these fries! For dessert later a bowl of fresh sliced Peaches. Transform your sandwich from ordinary to craveable with Hidden Valley™ Sandwich Spread & Dip in Smoked Bacon Ranch. Surprise your sandwich lovers. The delicious taste of Hidden Valley® isn’t just for salads anymore. Now you can create craveable sandwiches with new Hidden Valley™ Sandwich Spreads & Dips. The mouthwatering possibilities are practically endless, so grab your favorite sandwich fixings and start spreading the yum. 3. In a bowl, mix the sausage, cream cheese, and Parmesan cheese. 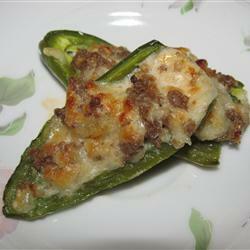 Spoon about 1 tablespoon sausage mixture into each jalapeno half. Arrange stuffed halves in baking dishes. 4. Bake 20 minutes in the preheated oven, until bubbly and lightly browned. Serve with Ranch dressing. 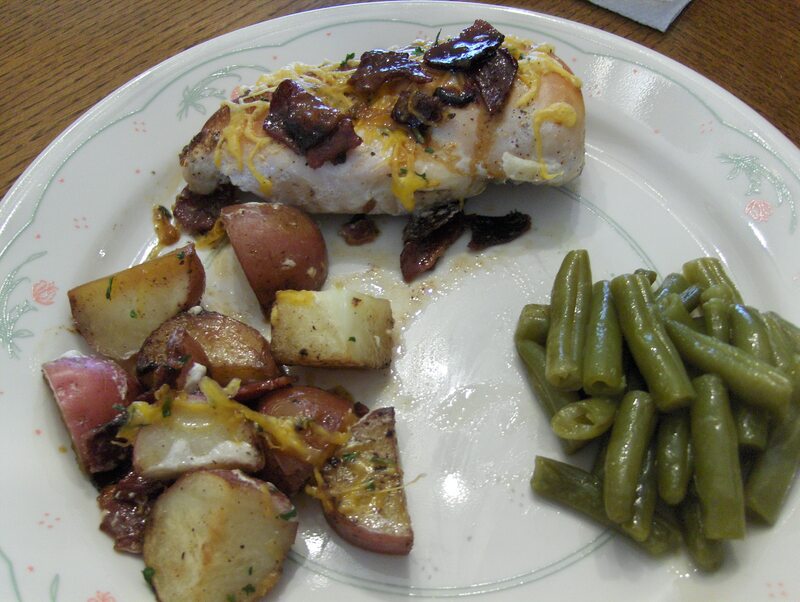 (Leftovers) Chicken & Roasted Red Potatoes w/ Green Beans and..
Dinner was so good yesterday I thought I would give it another try tonight! You got to love leftovers when they taste as good as this. I had come across this recipe on the http://www.kraftrecipes.com/home.aspx web site, I left the link and full recipe at the end of the post. I cut the carbs and calories from the Kraft recipe by using Turkey Bacon, Kraft Free Ranch Dressing and 2% Kraft Shredded Cheese. I also cut the amounts of all the ingredients listed to make just half of the recipe amount. I warmed it up and it was just as delicious as it was yesterday. If your looking for a Chicken dinner you have to give this a try! *POUR dressing over chicken in shallow dish. Refrigerate 30 min. to marinate. *HEAT oven to 400ºF. Cook bacon in large skillet on medium heat until crisp. Remove bacon from skillet, reserving 1 Tbsp. drippings in skillet. Drain bacon on paper towels. *ADD potatoes and onions to reserved drippings; cook 5 min., stirring occasionally. Remove from heat. Crumble bacon. Add to potato mixture; mix lightly. Spoon into 13×9-inch baking dish. 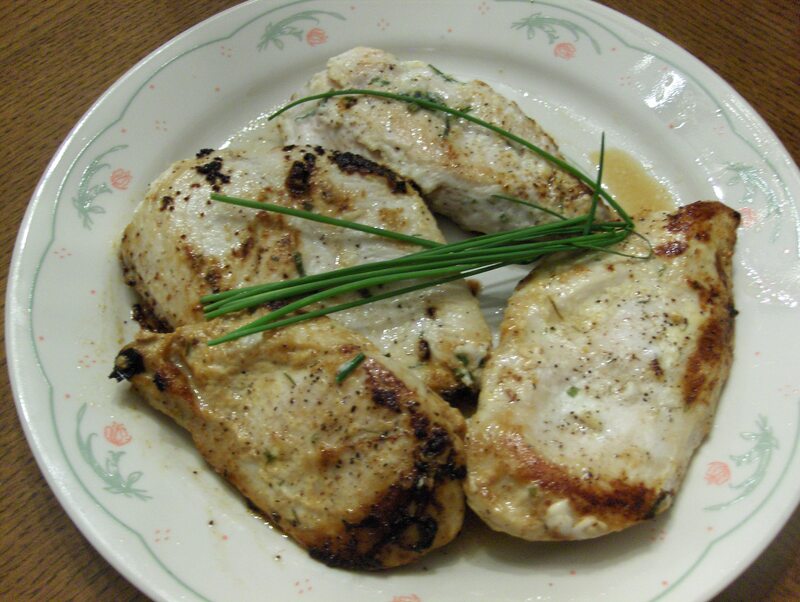 Remove chicken from marinade; discard marinade. Place chicken over potato mixture. *BAKE 55 min. 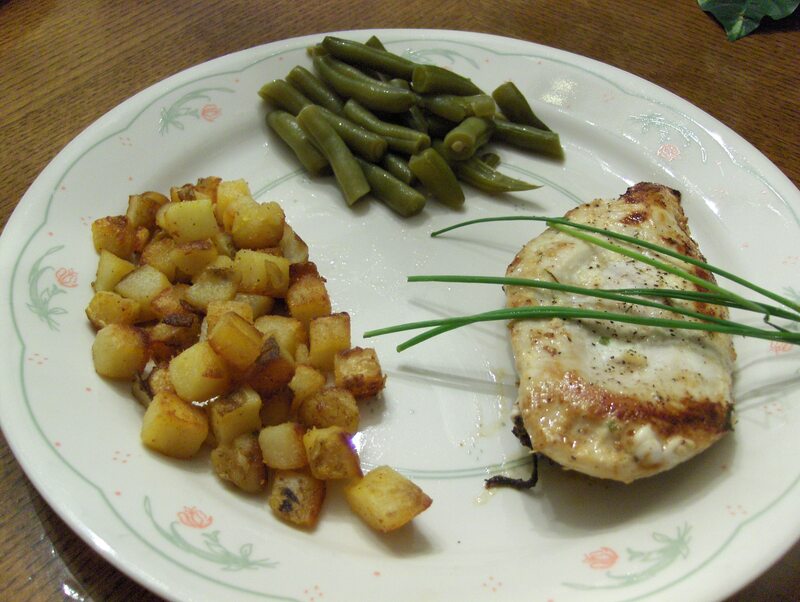 to 1 hour or until potatoes are tender and chicken is done (165ºF). Top with cheese and parsley. *Serve with cooked fresh green beans. *Mix 1/2 tsp. hot pepper sauce with ranch dressing before pouring over chicken. I tried another Rachael Ray recipe for dinner tonight, Buttermilk Ranch Chicken. A real easy and delicious recipe to put together. The Chicken is marinated in a mixture of Buttermilk, Mayo, Dried Mustard, fresh Chives, Dried Dill, Salt andpepper. I used Lowfat Buttermilk and Kraft Reduced Mayonnaise. You can marnate it from 45 minutes to overnight, I marinated mine for 3 hours. They came out moist and flavorful. I left the recipe at the end of the post. For sides I had Green Beans, Bob Evans Diced Seasoned Potatoes, and Healthy Life Whole Grain Bread. For dessert a Yoplait 100 Calorie Delight Chocolate Eclair Parfait. Combine all ingredients up to oil; marinate 45 minutes (or overnight). In large nonstick skillet, heat oil over medium heat; brown cutlets on both sides until cooked through, about 7 minutes.